Verdi’s masterpiece was written during the year 1849 in Paris and Busseto, completed in Naples, and first performed there on December 8, 1849 at the city’s Teatro San Carlo – just one and a half years before the worldwide success of “Rigoletto” and just over three years before “Il trovatore” and “La Traviata” – the three operas of Verdi’s creative middle period, known collectively as the “trilogia popolare”, which secured his international fame. Schiller’s tragedy tells the story of the calamitous love of the nobleman Ferdinand (Rodolfo in the opera) for the musician’s daughter Luisa Miller, who falls victim to a terrible court intrigue that ultimately drives both to their deaths. To turn the play into an opera Verdi worked intensively with his librettist Salvadore Cammarano; both men were fascinated by Schiller’s tableau-like dramaturgy, which matched their own ideas of an “epic drama”. The tragedy was given three acts, entitled “Amore” (Love), “Intrigo” (Intrigue) and “Veleno” (Poison). After its successful premiere, the work soon established itself and has remained a fixed part of the international opera repertoire to this day. In this concert performance (sung in the original Italian) at Munich’s Prinzregententheater, Marina Rebeka made her role debut as Luisa Miller. At around the same time, BR-KLASSIK released her CD “Amor fatale – Rossini Arias”, recorded in December 2016 and May 2017 together with the Münchner Rundfunkorchester under Marco Armiliato. This concept album, focusing on strong female characters in the tragic operas of Gioachino Rossini, came in for very high praise from the critics and is a bestseller in the BR-KLASSIK CD catalogue. 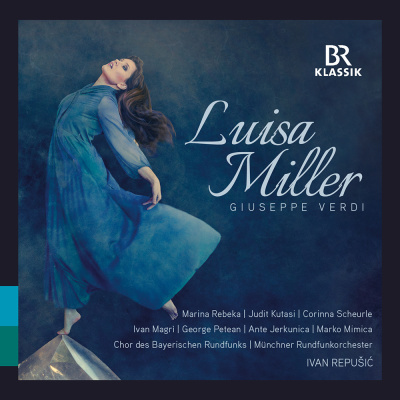 This complete recording of Verdi’s “Luisa Miller” is likely to be equally successful: Marina Rebeka sings the challenging role with technical perfection, giving it a sparkling vocal splendour. Ivan Repušić conducts truly theatrical Verdi here, with a performance that is vital, robust, fiery and very lively indeed. Watch the concert video in the Media Library.